What you need to know to buy jewelry on Etsy: a first-timer's guide. You are here: Home / Jewelry / Necklaces / So you want to buy jewelry on Etsy: a first-timer’s guide. So you want to buy jewelry on Etsy: a first-timer’s guide. Did you know that Etsy is a great place to look at vintage and antique jewelery? There is lots of stuff for sale on Etsy and you have to wade through it to get to the treasures – but the treasures are worth it, and the hurt is part of the fun. Always use keywords to narrow down the search when you’re looking for something specific (“Edwardian filigree onyx ring” is better than “pretty rings”). You can use the category filters on the right-hand side to limit your results – for example, you can choose to see only vintage items, and from those results you could choose to see only rings. If you’re browsing and you see something you like, add the store or the item to your favorites. It can be hard to find the same store twice if you forget the name, and often a seller who posts one item you like will post other items you’ll like also. If something is lacking in pictures or information, ask the seller questions. If they won’t answer your questions, don’t do business with them. If a seller doesn’t have positive reviews, don’t do business with them. If you do buy things, pay promptly and leave honest feedback. I once bought something through Etsy that broke as soon as I took it out of the package. When I wrote this as feedback on the seller’s page, she instantly contacted me to apologize, give my money back, and teach me how to fix the broken item. Many Etsy sellers accept returns, but not all. Never count on being able to return something unless it specifically says you can. Even then – don’t forget to check and see if you’ll be responsible for return shipping. Etsy gives prices up front, but they don’t include shipping. Don’t forget to mentally add shipping costs when you’re looking at the pretties. Now that you’re prepared to buy jewelry on Etsy, let’s get to the goodies. 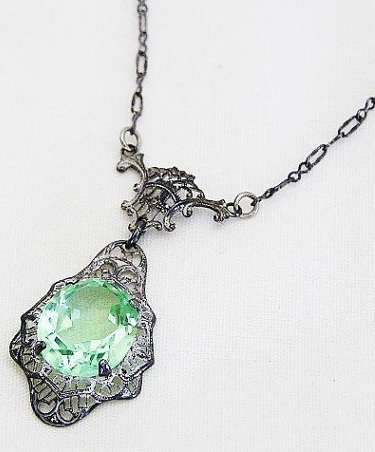 Here is some vintage/antique jewelry that I am currently drooling over on Etsy. Hello, beautiful. Maybe I don’t need to pay rent, really. Art Deco bracelet with double strand rhinestones and a green cabochon clasp, marked sterling, circa 1919. This 1920’s statement necklace is both fabulous and on-trend. Transitional Art Deco pink glass necklace. What do you think of my picks? Do you feel ready to buy jewelry on Etsy now? Thanks for your wonderful blog! I know this is an older post, but still very valid and well-done so I am commenting. As an Etsy seller of vintage jewelry, I’d like to remind buyers that Etsy is like a mall. Each shop is unique. So if you have a negative experience, please don’t tell the world that you hate Etsy! If you are looking for fine jewelry, read carefully as some shops will sell “gold” jewelry that is plated or gold-filled. Gold and silver can be presented as colors, and that can lead to mistakes. Also, look for shops that take the time to provide detailed descriptions and dimensions. Always click on the More link and study the details, as well as the Shop Policies, before you buy. Returns can be hard on us micro-businesses. Beyond finding a bauble that delights, you are making an investment. i would recommend that you freely browse on your phone but spend at your desktop. Mobile is convenient but it’s better for skimming than making serious purchases. Packaging is important. A bubble wrap envelope is not sufficient for shipping jewelry. Look beyond page 1 & 2 of your search. Skip to page 58 or 135 and you may find a treasure others have missed! I really love Jewelry …in this Blog you gain more knowledge about jewelry thanks for sharing this with us.keep it up or share more. Etsy and Ebay offer strong and quite reliable protection for buyers and it would be worth checking your jewelry once received with a professional jeweler and confirm the authenticity. If something is not right then you can claim and you will win your case on 100%. I lost my wedding ring a few months ago and have been looking for a vintage ring to replace it with. I really like your suggestion to keep track of an Etsy store if you like something that they sold, as they typically sell similar items as well. I am going to have to buy a notebook to keep track of the cute pieces I find. Thank you! A notebook sounds like a great idea. Good luck with your search! Dunno why my signature came up as Cruelty Free…I’m Crimson Vintique! I’ve been hearing a bit about your team since this post went up and I’m excited to look into it more! I wasn’t familiar with Etsy teams, and it sounds like a great way to find amazing new sellers. Thanks for the comment and the pinterest follow! Fantastic post! The pink necklace is from the shop of one of my Etsy team mates on the Vintage Jewelry Sellers on Etsy…her shop is amazing as is our team…and a safe place for all of your shoppers…great tips, great post…following you on pintrest now too! Beautiful pieces and great tips on navigating Etsy. It can be overwhelming at first, but there are so many great things to discover. Thanks, Kristina! I’m totally with you on Etsy – and really I think the hunt makes it all the more satisfying when you find something amazing. Great blog article! Thank you for including my pink transitional Art Deco necklace. It is honored to be here! Great article! Very timely information with the Holidays right around the corner. I found the link to it in a post to an Etsy sellers group I belong to called Vintage Jewelry Sellers on Etsy. I would further recommend to your readers that they buy from members of established teams on Etsy. Team members on teams like mine are constantly vetted for accuracy and honesty providing buyers with a more positive experiance. Thanks, Brenda! Great tip about Etsy teams – I’d never thought of that. I’m definitely going to look into your team.